Another Guerlain Classic, L’Heure Bleue was created in 1912 with a little story about the inspiration behind L’Heure Bleue. Even though the story came to be a while after the fragrance did. L’Heure Bleue, being an old classic of the Guerlain classics family finds its niche in such greats as Shalimar, Jicky, and Mitsouko. It has that definitive Guerlain base to it that makes fragrance lovers–well, anyone who’s smelled more than one classic Guerlain–instantly know where it’s coming from and what levels of history they can expect. In Bottle: That Guerlain signature scent is present in pretty much every classic they’ve put out. Though the base is a bit masked in the newer creations, it is the base that sets the stage for the old perfumes. L’Heure Bleue is no different. I get the base immediately, followed by neroli’s powerful presence, and the spiciness of carnation. Applied: The base is the first to fade to the background but it never goes away. Neroli is up front and center followed by the spiciness of carnation. It’s strange how a fragrance can make one feel warm or cold. L’Heure Bleue feels cold. It’s a reflection of its namesake, the twilight hour when the land is coated in blue. The name itself is a dead giveaway, L’Heure Bleue translated to “Blue Hour”. And like most classic fragrances, I often have a hard time deconstructing them because they’re blended to discourage deconstruction. I can only get the feeling and have this mental block telling me that’s silly to try to describe it beyond that. So what I can say of this experience is that this starts off as a chilly citrus. It maintains the chilliness as the citrus melts away into a very classic fragrance with dominant notes of neroli, carnation, and a vanilla base that’s barely detectable. Extra: One thing I’ve noticed with most people’s reactions to L’Heure Bleue is the aversion to a particular note. L’Heure Bleue, more so than other classics, is referred to as an “old lady perfume”. There’s a correlation there, I think. In particular, the neroli note derived from the bitter orange tree. To me, it smells extremely similar to the more acceptable, bergamot. By the way, wondering how to pronounce this? Here you go: L’Heure Bleue (Lehr Bloo). Design: The bottle of L’Heure Bleue I own is nearly as small as Mitsouko but I do own more of this juice. I find it more wearable than Mitsouko, personally. Even though some people would try to tell me I smell like an old lady. The bottle really is very similar and quite frankly, there’s not a whole lot to say beyond that. Mitsouko is a slightly greener, cooler color whereas, L’Heure Bleue (funny enough) is a warmer color. I find the bottle design to be more fitting for Mitsouko but I still appreciate the elements of it. Notes: Bergamot, neroli, clove, jasmine, carnation, cedar, musk, vanilla. Slowly working my way up to Shalimar whose initial burst still puts me off and it is the initial burst in that one that does it. I’m sure she’s beautiful once she settles down. In the mean time, I’ve got L’Heure Bleue, a fun fragrance to say and a beautiful, grown-up classic. 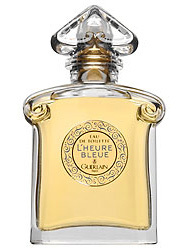 Reviewed in This Post: L’Heure Bleue, 2007, Eau de Toilette. This entry was posted in classic, floral, guerlain, oriental, Reviews By House, spicy and tagged bergamot, blue hour, carnation, cedar, classic fragrance, clove, guerlain, guerlinade, heure bleue, jasmine, jicky, musk, neroli, twilight hour, vanilla. Bookmark the permalink.